There is something about black and white. Some may call it boring while others call it timeless! There is a romance and elegance that comes when working with black and white. Whether it is the cake or the dress, anyone can make it work! Project Runway's Tim Gunn's famous words "Make it work!" The texture and ribbons really add to this work of art. 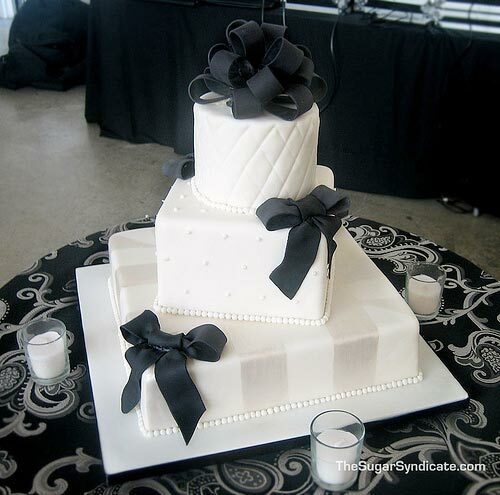 Your food can be decked out in black and white too! 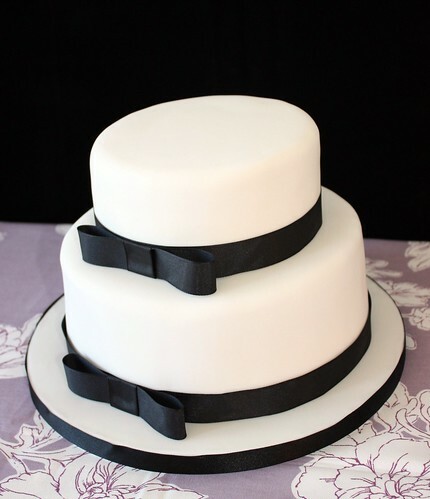 A short black and white Vera Wang.... do you think a short wedding dress is classy or tacky? Although no one ever wants to call Vera tacky...that's just wrong! More ribbon cakes... I'm sensing a trend. Imagine if your man put on a pair of these?! Mmmm.... you just can't resist a guy in a black and white tux!